ShedSafe Accredited Manufacturers have successfully completed a third party review for engineering and design conducted by independent consulting engineers. A number of the Accredited Manufacturers listed below sell their sheds direct to the public, others sell through a network of shed sellers. All Lockyer Sheds Staff and offices have been fully accredited for Shed Safe procedures. Find an accredited shed seller here : Accredited Shed Sellers. Getting the right shed for the job is more than just working out the best size, shape and aesthetic that you want, its needs the correct specification for your site. Each shed location is unique in terms of the site and exposure to the elements. Your accredited shed seller will need to ask you a number of questions to allow them to generate a specification suitable for your building use and location. Sheds supplied for different purposes will have different building classes and design. It is very important that the correct site wind speed is determined for your site. The higher the site wind speed, the stronger your shed will need to be to resist wind forces. If your shed is in a protected area, the wind speed can normally be reduced and a lower design can be applied. Your ShedSafe accredited seller has successfully completed shed specification training to assist them to recommend a suitable shed specification for your site. What will the shed be used for – domestic, farm or industrial use? How far from the coastline will the shed be built? Will it be subject to extreme conditions, e.g. snow, cyclones? What is the surrounding area generally like – suburban, semi open or open plain and exposed? Will the shed be built on or near a hill, slope or escarpment? Are there existing structures near where you want to build your shed? How far away are these from the site? Each shed location is unique and as a result it is necessary to determine the use (building class) and site wind speed to determine the correct specification for that shed. Sheds intended for Cyclonic or Snow regions are required to consider these extreme conditions in their design. ShedSafe accredited shed sellers provide the following information on quotes. Wind Region The location of the shed will determine which wind speed region will be applied to ensure that your shed withstands weather conditions. Importance Level is determined by what you intend to use the shed for, and is crucial for ensuring that your shed complies with the Building Code of Australia. Terrain Category is determined by what surrounds the proposed site of the shed. Shielding factor is determined by whether the proposed site is shielded by permanent structures. 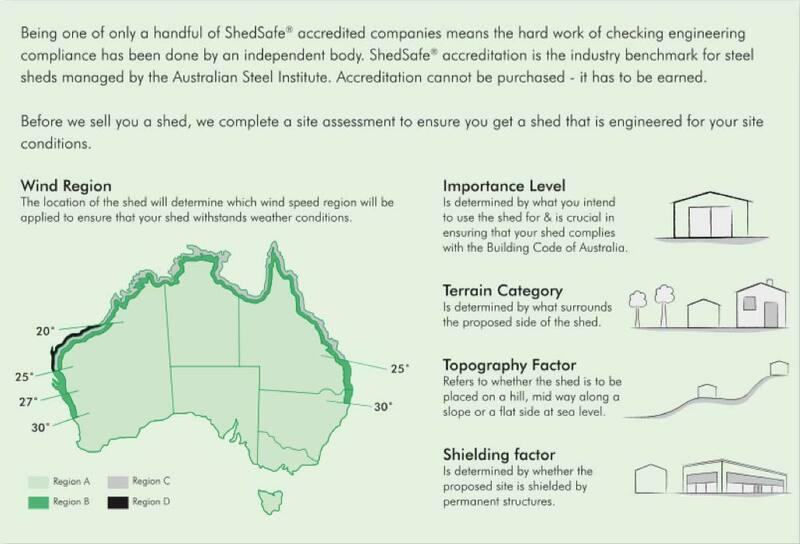 Your ShedSafe accredited supplier will provide you with a quotation that will show a site wind speed m/s (metres per second) and the values of the factors above that were used to calculate that wind speed. The site wind speed is a rating on the strength of your shed. Check the site wind speeds on the quotations you receive. Generally, the lower the site wind speed, the less steel is required and the cost will reduce. If your shed supplier is NOT constructing the shed, you should speak with a licensed builder and or building certifier to determine the suitability of the quoted specification for the intended site. This may require a site visit in some circumstances. Don’t get caught out by buying a shed that won’t pass council. Do not accept quotations from shed suppliers that refer to “w” values i.e. W41 as these codes are obsolete. Quotations from shed suppliers that show wind speeds N2 or C2 or similar, are nominations applicable for houses and some small class10a sheds. Ask the shed seller for a quote with the site wind speed expressed in metres per second.